Kerry Callen's Blog! : What if DC published Marvel characters in the 1960's? These are great, what a bizarre era at DC. Brilliant and hilarious! I want to see more! I've got several of these odd DC 60s books in my collection simply because the covers are so odd. Love 'em. You need to invite people to do these like that guy who does the cover redos. Absolute genius. Love that Cap cover. More please! And thus the legacy of Julius Schwartz humiliates us all once again. Those look amazing. I like how you made them look frayed as well. Very nice. Sign me up for the Essentials collection. Yup, sad but very true. DC was bonkers insane there for a while (a few decades!). From Lois walking around with a lead box on her head to hide her secrets from Superman to Batman's wardrobe filled with rainbow-colored bat-costumes, it's pretty obvious the DC office LSD vending machine was constantly in need of restocking. Please, please, please do more of these! I haven't laughed that hard in years!!! You've opened the box Kerry. Time to get back to the drawing board, no more slacking off! MORE WE MUST SEE MORE! Oh, well done. These just make me love Silver Age DC even more, if that's even possible. I found your blog through thedailywh.at and I must say EVERYTHING is amazing! It's all beautifully illustrated AND hilarious. 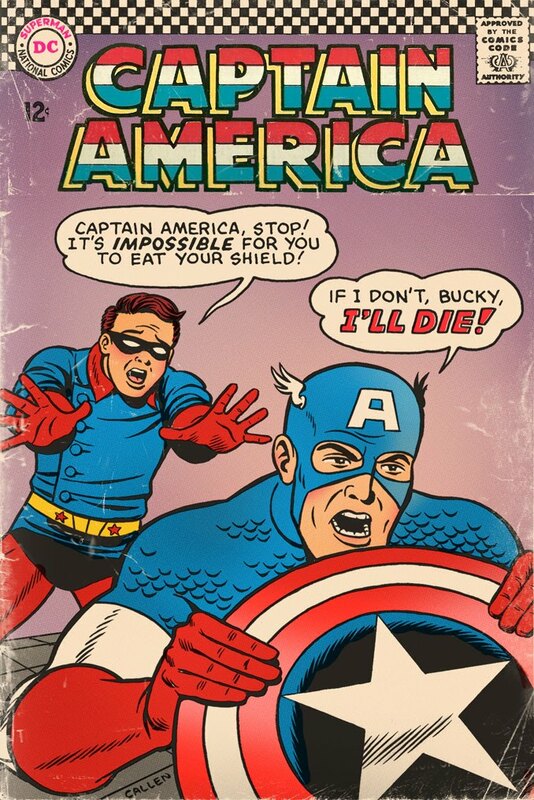 DC probably would have gone all out added a bib and cutlery to the Captain and showed him at fancy restaurant table with a snooty waiter and Bucky as a shocked busboy. Spidey they'd likely have contented themselves with him busting a scale or at a guess your weight carnival. I want to read these stories. hilarious! i would love to have read these! These are great. Please do more. I normally don't collect silver age DC because the odd covers. Nice to see a little humour from them. I'm kicking myself hard for not thinking of this. Very funny. Hard to believe it was the same era in comics but I guess each had their niche where now I think the Big 2 are almost indistinguishable (lots of creators cross over to the other one). That's astonishingly clever -- and remarkably well executed. Thank you. These are fantastic. I'd love to see the opposite as well. Great stuff. It captures the futile lunacy of those old DC mags beautifully. Genius. I concur with Anonymous #1's suggestion. I love those covers. I'm bookmarking your website. Keep 'em coming! I remember those stories! Of course, they were not as interesting as the covers promised. In the Spidey story, Gwen and Mary Jane tried to get proof that Peter was Spider-Man by tempting him with cake and pie, then watching Spidey in action to see if he’d gained weight. Peter had to go into extreme action in private to work off the weight before getting into costume. The cover was just a “what if this goes on” dream sequence. There was a funny final scene of the girls on exercise bikes; trying to work off the extra pounds they gained pursuing their scheme. The Cap story was about a surprise birthday for Bucky. 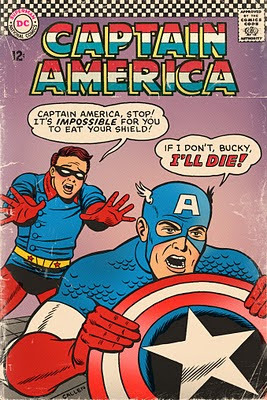 The shield was an edible party favor replica, but when Zemo attacked, Cap was forced to hold him off with only a marzipan shield. Ha! I had no idea what was inside of those! OH MY GOD!!! MORE! MORE!!! Nice try on those plots! I <3 this work Kerry and hope you get something commercial noticed in exchange for your humor and generosity. The aging effects get especial high marks. May I please know which character is actually there in costume of Spiderman in this parody? I am not really into comics but this is kinda curious thing for me. Please I am waiting. Given that the character's thought bubble references "aunt may", it must be Peter Porker. Yeah, I went there. i have read and this may or may not be true that dc did a survey in the 1960's and the results showed that dark blue or purple covers with a gorilla on them out sold all of their other titles. Great work. Thanks for the excellent, well-researched satire. I am humbled by your genius. Please do more of these, and don't forget the ones where the hero is being a total jerk for no reason. "A bus load of children are driving over the cliff! Why are the Fantastic Four standing there laughing?" FF: "Har, Har! Let 'em die!" My comic book guy said "Broken home: Marvel - Happy Home, DC." oh man, i want the fat spidey one on the spinner rack in my living room. 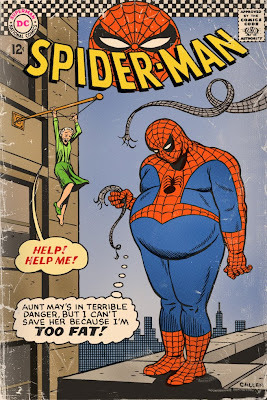 I just have to say...that Fat Spidey fills me with unholy joy. You just made a sad, jaded man laugh like a little girl. Bravo! Spiderman looked a bit like that anyway on the rare occasions when Jack Kirby drew him. Time to do more of these. Epic!